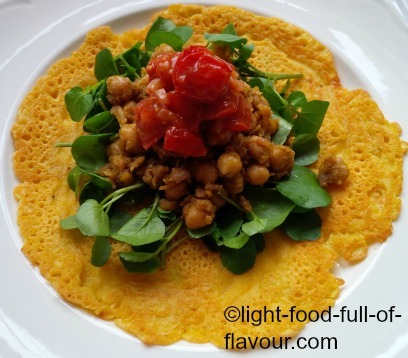 Pancakes with a difference, gluten-free socca pancakes which are made with gram (chickpea) flour, water and olive oil - making them dairy-free as well. I add spices to the batter as well to give these pancakes more oomph! In this recipe, I have chosen to serve my socca pancakes with a spicy sweet potato and chickpea stir-fry. As I had also made a batch of oven-roasted tomato sauce the day before, I added a dollop of this on top. Total Yum! You could just add some tomatoes to the stir-fry instead of the oven-roasted tomatoes. I’ve added them to this recipe. 1. Start by making the batter for the socca pancakes. Add the gram flour, water, olive oil, spices and salt to a bowl and whisk until you have a smooth batter. Leave to rest for at least 15 minutes. 2. Add the coconut (or olive oil) to a large frying pan over a medium-high heat. 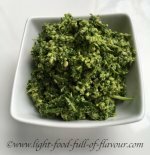 Once the oil is hot, add the mustard seeds and as soon as they start to crackle and pop, add the chopped onion, and minced ginger and garlic, ground coriander (cilantro), cumin and chilli flakes to the pan. Season with some sea salt and black pepper and stir-fry for about 5 minutes. 3. Add the grated sweet potato and tomatoes - continue to stir-fry for another 5 minutes. At the end, add the cooked chickpeas. Turn off the heat. 4. To make the gluten-free socca pancakes – add a teaspoon of coconut oil to a frying pan over a medium-high heat. Wait until the oil is really hot before adding a small lade-full of batter to the pan. Cook for about 2-3 minutes – until bubbles appear – then flip and cook the other side for about 2 minutes. Place the pancake on a plate and repeat with the rest of the batter. 5. Once the pancakes are ready, quickly re-heat the stir-fried mix. Add the fresh coriander (cilantro). To serve, top the pancakes with watercress or rocket leaves followed by some of the stir-fry.